Kukeri Wines is the brainchild of the winemaker Petar Kirilov, founder of VinoEnology.com, who wanted to create a label to tell the story of old Thracian tradition. The first release of Kukeri Wines is 50 cases of 100% Cabernet Sauvignon, offering unique terroir of a vineyard in Mt. Veeder, Napa Valley. Mount Veeder AVA is an American Viticultural Area located in the Mayacamas Mountains overlooking the opening of the Napa Valley. Officially recognized in 1990, Mt. Veeder is a small 25-square-mile appellation with 1,000 acres of planted grape vines on thin volcanic soil. Many of the vineyards are planted on the steep mountain face with elevations ranging from 400 to 2,677 feet. The unique terroir of the Mount Veeder AVA produces wines that are typically powerful in structure - depending upon how they are produced, and how the vines are tended. For example, Cabernet Sauvignon has been the king of this mountain throughout the AVA's history, and is usually produced in limited quantities. 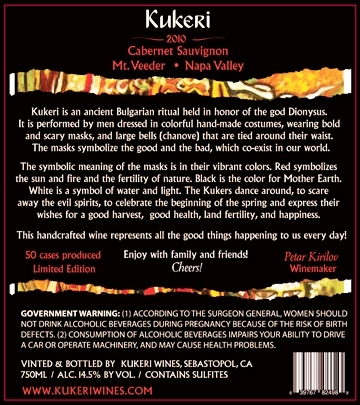 Kukeri Wines now offers vintage 100% Cabernet Sauvignon to the wine lovers. A fine example of their creations is the 2010 Kukeri Cabernet Sauvignon that comes from a vineyard with high elevation, steep slopes and sedimentary clay and volcanic soil, which restrict the root growth. This Iconic Napa Cabernet has been aged in French oak barrels for 36 months. True to the Mount Veeder appellation, this wine exhibits dark concentrated fruit flavors of cassis, blueberry and blackberry and bold integrated fine-grained tannins. Mount Veeder has a very wide range of microclimates, due to the many sharp curves and exposures in the mountain. The bay breezes cool the mountain, resulting in a Bordeaux-like climate; with minimal temperature change each day. Visit the official website to know more about the various offerings of Kukeri Wines. “Kukeri” is an ancient Bulgarian ritual that dates back to about 8,000 ago – the era of ancient Thracians. 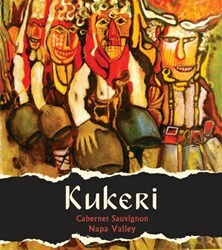 To know more, visit http://kukeriwines.com.